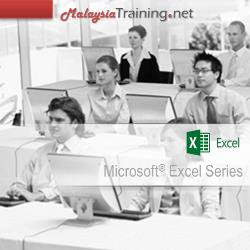 For users who have completed Microsoft Excel Basic & Intermediate. Conditional formatting is one of the most useful, but underutilized tools in Excel. By instantly "visualizing data", conditional formatting is capable of highlighting important information that often unaware of us. It's great for busy managers and executives who like to scan for the most important information as quicker as possible. Conditional formatting is a great way to visually highlight important information in a worksheet. You can think of conditional formatting as an automated formatting that is triggered by conditions you defined. For instance, you can use conditional formatting to automatically change the color of cells that contain values greater than or less certain values. This course covers the basics of conditional formatting and from there moving towards applying specific formulas to further enhance the criteria settings of each condition. This course will also guide you on how to apply conditional formatting to Pivot. For users of Excel 2013 - 2016 we further guide you on how you can use Slicers effectively to be linked to tables with Conditional Formatting. What is excel conditional formatting? This course is Instructor led group-paced, hands-on classroom-training with activities. Manuals are provided for each student for after-class reference.